Each prospective client’s order is individually computed using the most current clothing prices. Please send us a message with the info requested below and we will send a quote back within 24 hours. The number of colors in the design: If you’re unclear about the number of colors, or if your design is photographic in nature, please call us for a free consultation. We’ll be happy to analyze the design for you and give you the best options for reproduction. The number of print locations: Front, back, sleeve, pocket? If you’re not sure, you can view our t-shirt sizing section. Quantity and shirt type: See our online catalog for shirt ideas. If you can’t readily find what you’re looking for, please call us for some help! We have many more brands to choose from that aren’t listed on the site. Send us your camera-ready artwork or contact us with your ideas.  Custom T-Shirts and Custom Embroidery with LOW MINIMUM ORDERS! We only use your email address for purposes of giving you a quote. Tomahawk will not share your personal information with anyone.